We are happy to announce that Country Club Villas #311, is now available as a vacation rental!! 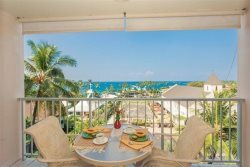 Enjoy the Expansive Ocean View from this beautifully remodeled, 3rd floor condo with cathedral height ceilings and an expanded loft, which could really be considered a 3rd bedroom! The remodeled kitchen has platinum slab granite, stainless KitchenAid appliances and porcelain tiled flooring. This is a great place to prepare meals during your visit. The living room includes a wet bar, a remotely operated 54" Sony TV that drops down from the ceiling when needed. Living and dining area have handsome cork flooring. The bedrooms and loft have plush carpeting, decorator furnishings and custom wood blinds throughout. The Master Bedroom incudes a new King Size Bed and on-suite. The guest bedroom includes a Queen Bed. Both bathrooms have custom tile shower surround (tub in guest bath) with glass doors. The expanded loft area with a is perfect for an office or reading nook and has room for extra guests (two twin beds provided). The custom loft wood blinds have remote operation for drawing during late afternoon sun. The spacious lanai has been tiled, includes a dining table for four and two comfortable lounge chairs with ottomans. In addition, the lanai includes sun shades, to keep cool in the afternoon. For your convince, also included is a Full Size LG washer and dryer. Located along the Kona Country Club golf course, the Country Club Villas' fabulous amenities include 3 swimming pools with spa, two tennis courts and lush tropical landscaping. Popular Keauhou Resort offers shopping, dining and services, and fishing, boating and water activities are available at nearby Keauhou Bay. The Kailua-Kona Coast has the most colorful and spectacular pink, lavender, and orange sunsets in Hawaii. Maybe you’ll be lucky and spot the famous 'Green Flash” at sunset, as the sun dips behind the horizon. You can watch the incredible Kona sunsets right from one of the decks or the lanai, as well as the cruise ships, para-sailing, whales and dolphins. The Kailua-Kona Historical Village is a short drive from Country Club Villas (5 miles north on Alii Drive) . The Village is very quaint, with lots of charm and good shopping right along the water’s edge. Some of the activities you can find in the Village and nearby are: beaches, luau’s, farmer’s markets, art galleries, jewelry shops, restaurants, boating, snorkeling, scuba diving, surfing, boogie boarding, and deep sea fishing…Just about every water sport you can think of! There are also several great golf courses nearby. There is so much to do to stay active, or you can do nothing and just lounge on the beach. Kitchen: Blender, Coffee Maker, Teapot, Cookware, Corkscrew, Full Kitchen, Microwave, Mixer, Refrigerator, Rice Cooker, Toaster, Wine Glasses and more!